It has been a long time coming, but we are pleased to announce that we have completed the department's 100-year history. Enough cannot be said about everyone that helped make this dream become a reality, so we hope a sincere "thank you" to everyone will suffice for now. 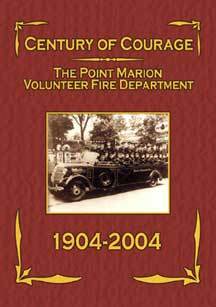 Our history book, "Century of Courage: The Point Marion Volunteer Fire Department 1904 - 2004," was published in May 2004. The arduous task of compiling and sifting through piles of department records began in the summer of 2000. After fumbling around for quite some time, we spent the better part of the last two years researching the information we gathered. It took a lot of time that many of us really couldn't spare. However, teamwork prevailed and we were able to get the job done not a moment too late. We are very passionate about our history book. Not only has it taken a lot of time for us to write it, but also it has taken us 100 years to become part of history just so we could. Although the book is simply about the history of our fire department, we believe its contents will strike a common cord with others as well, especially since so many fire departments have had the same humble beginnings. We know our book isn't "bestseller" material, but we think we've done a tremendous job for a bunch of firefighters [chuckle]. There are limited prints available, so order your copy soon. Download the order form now and send it out today! For questions or comments, please email the history book project team. Contact the Webmaster for questions or comments about this site. © 2002-2012 Point Marion Volunteer Fire Department. All Rights Reserved.